BEIJING - China has begun building a highway to Mount Everest base camp, partly to smooth the way for the carrying of the Olympic torch up to the highest peak in the world, Chinese press reported Tuesday. 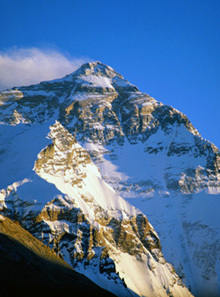 File photo of the Mount Everest. The new road will begin at the base of the mountain in China's Tibet region and replace a rough 108-kilometre (67-mile) track that leads to the northern base camp, the Xinhua news agency reported. Construction of the 150-million-yuan (20-million-dollar) highway began on Monday and will take about four months to complete, according to Xinhua. The road is being built to "ease the path of those bearing the Olympic torch," Xinhua said. Organisers of next year's Beijing Olympics have said they intend to include the summit of Mount Everest in the 130-day torch relay leading up to the Games. The relay, which will traverse five continents, will begin in Beijing on March 31 next year, with the attempt to reach the summit of Everest slated for May. The Xinhua report also said the new highway would help ease the way for the growing number of tourists who are travelling to base camp, which is 5,200 metres (17,160 feet) above sea level.